First off let me congratulate everyone with a New 2014 Year! I would like to wish all my readers a great year and may all your images come out better than you expect! I have not written anything on here for a while because the bus and I have been stationed in San Diego and have not done much traveling at all. However the events of earlier this week do deserve a special notice, so here we go - my first update of 2014. 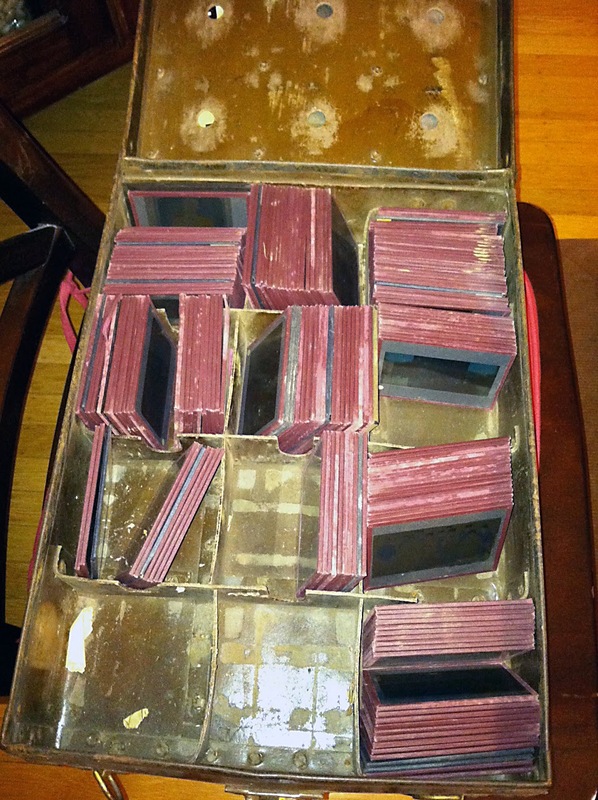 Some of you may remember that about a year ago I published on here a story about purchasing a collection of Magic Lantern Slides taken by John Rahill in Russia during the winter of 1917/18 while he was doing work for YMCA. The story made international news and I was pleasantly surprised with the amount of interest these images generated. Later, during my summer travels, I visited YMCA archives in Minneapolis MN and actually found some good useful information that will come in handy in both explaining my recent discovery and my theories about how things unfolded. This summer I wrote an article about the slides for a magazine caller Russian Life and supplemented it with a few images. This publication focuses on Russian diaspora and historic accounts of the motherland. The article was warmly received and I got a lot of feedback, well wishes on my re-photographing mission and invites for Magic Lantern Shows. One thing that followed though was completely unexpected. 4 months after the article appeared in print I got an email from Portland Oregon in which a grandson of one of YMCA workers who happened to be in Russia on the same mission as Rahill told me that he also has a large collection of lantern slides that his grandfather took during that memorable journey. He said that similarities in the nature of our collection were striking and invited me to come and see the slides for myself. Imagine my excitement when I thought that there is another never before seen set of slides of war-torn Russia as seen through a different set of eyes. The name of his grandfather also appears a few times in note cards that came with my slide set - I assumed that the two men must have traveled together for some time and so took some pictures of each other. I was very much looking forward to seeing new images of John Rahill and to showing my Portland host new images of his grandfather. With that in mind I booked a flight with a plan to stay there for two nights. I got to Portland on Tuesday evening and was met by Kurt - the kind slide owner who agreed to put me up for couple of nights at his house (I will withhold his and his last name for privacy's sake). Excitement was palpable in the air as we started the short drive from the airport to his place. It was a foggy evening and I think that was very symbolic of the situation - neither of us really knew what to expect from each others pictures. As we drove slowly through the surface streets of northern Portland, Kurt noted that he recognized a picture or two from the ones that were published in Russian Life as also being present in his set. I didn't think much of it. As I mentioned in my previous post I have found a few duplicate images in Stanford archives among Russel Storey's images, it seems that a practice of sharing key frames for personal presentations was present at the time. However, next Kurt described a few images that I possess, but have not published anywhere and that rang some alarm bells. By the time we parked by his house Kurt and I figured out that what I was actually about to see was a complete DUPLICATE set of magic lantern slides made from John Rahill's slides! I can't place my feelings with any exactness on the scale between excitement and disappointment after this fact was first realized. On one hand there were new images to be seen and therefore no new visual information to be gained that could help me with my research. On the other hand it was still rather incredible to see a duplicate set of images form 95+ years ago! Remember going to a photo processing facility after a vacation and asking them to make two sets of 4x6 prints so you could give one to your friend who traveled with you? What are the chances of those two sets finding each other nearly a century later? Well these two sets did! 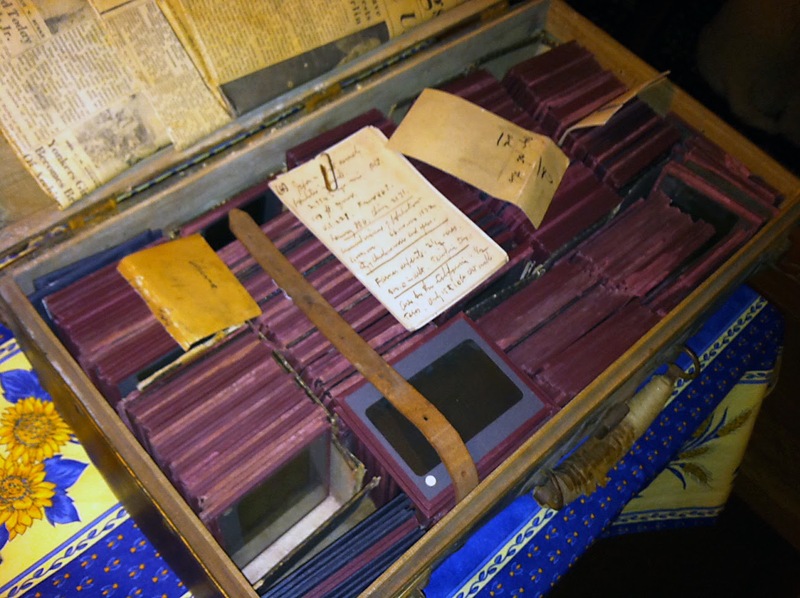 When we walked into Kurt's dining room I saw waiting there two suitcases full of lantern slides with exact same red binding as those in my possession. Here they are as I first saw them. As you can see in the first picture some notes of Carl (Kurt's grandfather) were also present, so I was hoping to gain some insights into places visited by him. It turned out that not only those notes were written in such handwriting that none of us could understand more than a word here or there, but what was indeed deciphered did not contain any helpful particulars.... I started going through the glass plates rather quickly - by now I have seen them many times and was now looking for images that may be missing from my set. I did not see a single photo that was not the exact duplicate. Now that I'm thinking of it there may have indeed need a few that I thought I had, but in fact only remember from the black and white proof prints and may not have in slide format. Either way at least 98% of the 400 or so plates that Kurt has are exact copies or Rahill collection. I must add a word of caution to all those who read this and my have some slides stored away in their basement or attics - be careful with these things! They are made of fragile 1mm thick glass and are also sensitive to moisture. Keep them in a dry place and if they are in a basement elevate them from the floor in case of an unexpected flood. When carrying them around try to not turn the cases these slides are kept in onto different sides - carry them in the same position that they are stored in, that glass breaks very easily and while the top cover glass can be easily replaced, the bottom piece carries emulsion and the image and so if that one breaks your slide is toast. It seems that at some point during the last 90+ years Kurt's a lot of slides have come in contact with water, which made the cloth sealing tape come apart and some water even seeped in between the glass and completely dissolved parts of many images. Also there were a lot more broken slides than in Rahill's set - that may be due to them being moved from house to house more times. Still, this is a great find and I was a bit puzzled on how/why would a second set like this be created. In search for the answer I dove into the research from Minnesota and soon discovered that whenever Rahill's name was mentioned in any correspondence or official logs the name of Kurt's grandfather was right side by side. Not only did they leave for Russia aboard the same ship and were on the same train coming back from Samara, but they were also mentioned as traveling together to the front lines. To top it all off they were both from Cleveland Ohio. Now I am thinking that the two buddies signed up for YMCA service together and must have gone through the entire trip together. It remains to be conclusively proven whether they actually ran the Soldier's Home in Valk together, but in the field report from Rahill reads "Out work...", not "My work", so I take that as a clue to Carl being there with him. That would also explain why Carl would want a complete second set of slides that John took - after all, they have seen the exact same things and lived through the same experience together. Kurt also had a couple of things I have not seen before that excited me very much. First off was a simple empty box about 3x3.5x4in. To some it may have seemed like an insignificant little paper box with some Russian font on it, but to me it was a little treasure and Kurt kindly gifted it to me seeing how my eyes lit up after I saw it. 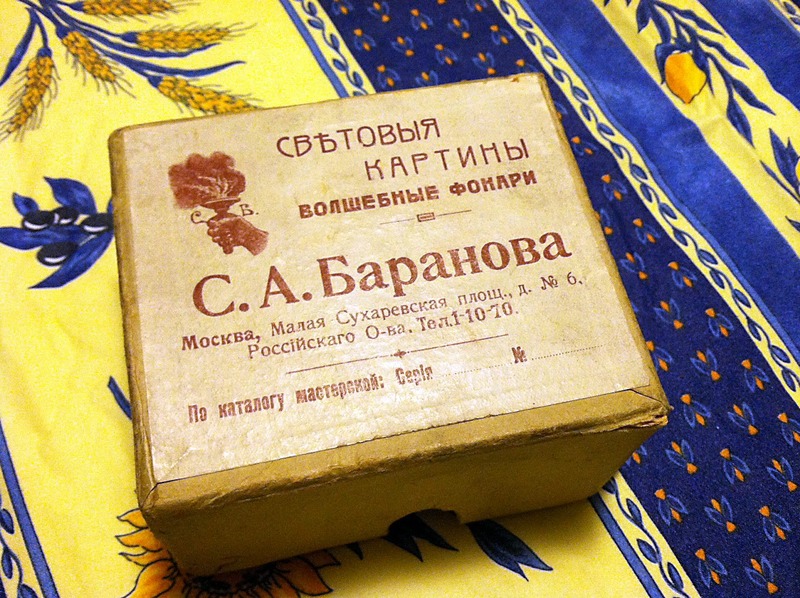 This is the original box in which John and Carl purchased Magic Lantern Slides from the studio of S. A. Baranov in Moscow. Carl's set also came with a number of these commercial slides that were exact same frames that John brought back with him (though I think there were 5-10 less of them there than what I have). The best thing though was actually the slide projector that Kurt pulled out late at night. 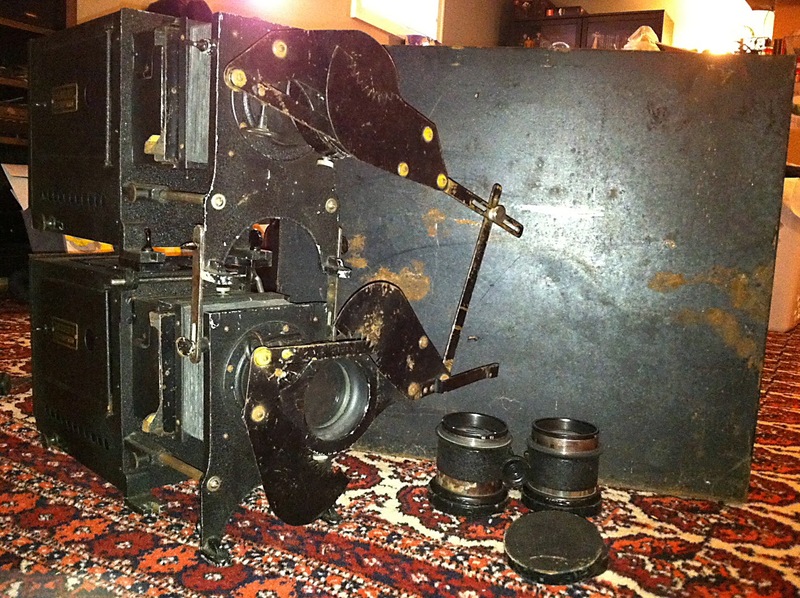 This is a double projector (basically actually two projectors in a stack) made by Chas Beseler. It took me a good amount of time next morning to figure out the exact configuration in which is was intended to function, but eventually I got it all together and found out that it's only missing very few non-essential screws. The projector actually came with two sets of lenses (10 and 15in) and the original cross-fade attachment that you can see in front of the lenses. These attachments are relatively fragile and not too many of them have survived intact. After seeing my excitement Kurt kindly contributed this old beast to The Photo Palace Bus arsenal and now this is the projector I will be using during my slide shows. This will do two things for the show - make my life a lot easier because I can now adapt much quicker to any combination of room and screen size and make the viewing experience a lot more smooth and enjoyable because I will be able to switch out some of the older slides that I exhibit while the one is still being projected. Previously at the beginning of my program when those older slides are featured I had to have a moment of blank white lite upon the screen while I took out one slide and replaced it with the next one. With this projector one slide can be upon a screen while I replace the slide in the other carrier and then cross-fade to it - no more white screen time! Well, that concluded my short tale of a Portland Lantern Slide Adventure. I would like to thank Kurt and his wife Anette for sharing their home with me, what excellent and pleasant hosts they are. Maybe next time I'm in the area I can grab some supplies and spend some time repairing the damage to some of Kurt's slides so to lessen the stress on broken slides and to prevent oxidation in those that are missing sealing tape or have broken cover glass. I also wanted to quickly mention that my Book Campaign is still ongoing and there are less than three weeks to pitch in, help me write an great story and get yourself a beautiful tintype plate. Please click HERE to see all the possibilities.